Plant of the Month: Vrieseas with Alan Phythian. 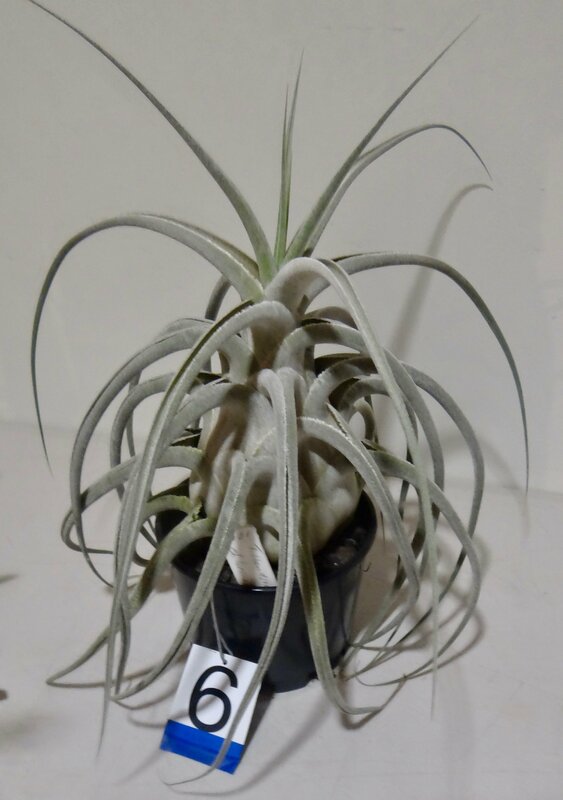 Tillandsia lindenii name change with True Grant. Members Survey deadline is 18 July. 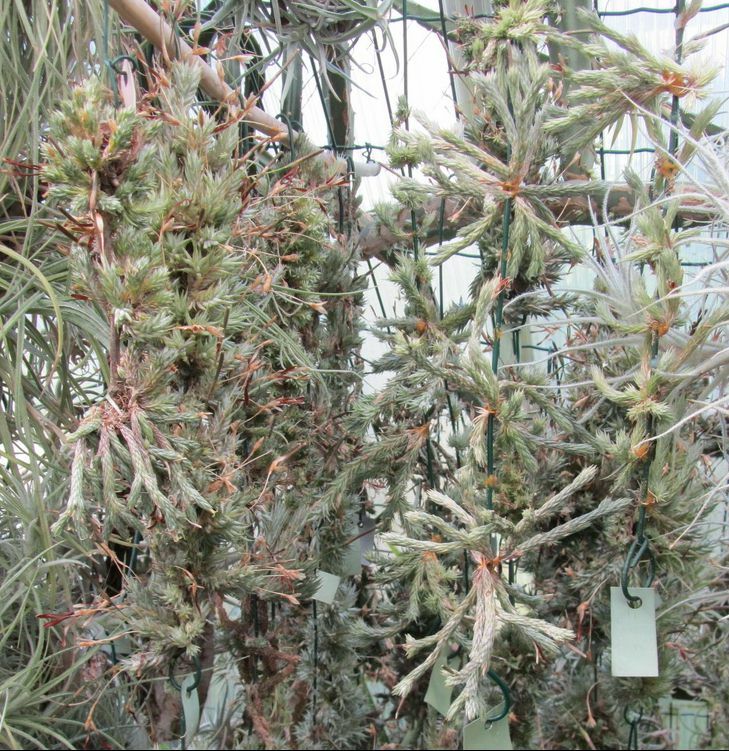 Two interesting Tillandsias with Peter Paroz. Grace Goode OAM turns 100 years. Alan Phythian started with orchids 60 years ago, and got into breeding bromeliads at least 10 years ago. He remembers when 'Red Chestnut' seedlings cost $100 per pup. 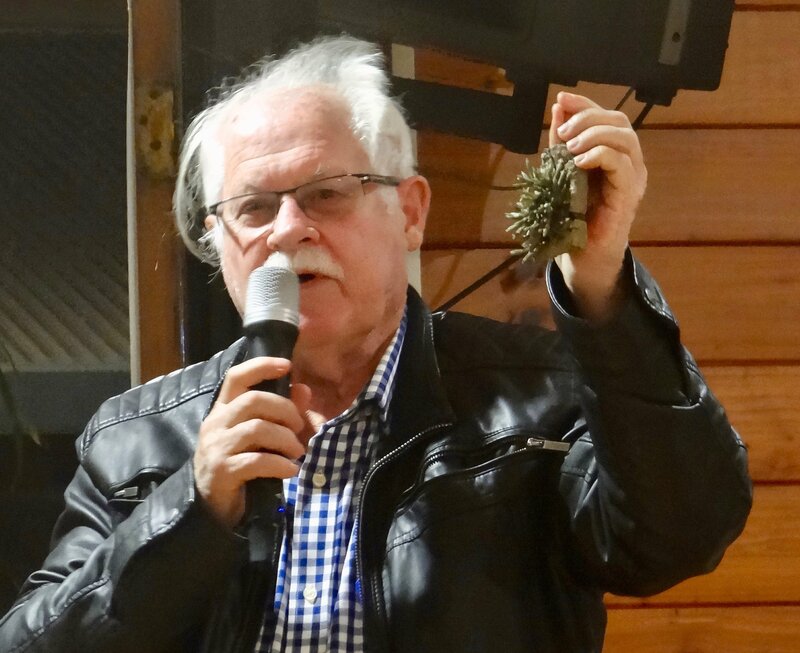 He brought along a full table of his creations derived from three batches of Vriesea fosteriana varieties, and another two that he grew from seed imported from John Nicholls in New Zealand. Alan loves the red color in fosteriana and selected his seedlings to further intensify the red color, and to get bigger plants. He grows his plants under 70% cream shadecloth. He found that plants imported from N.Z. lost their colour. He sells some on FaceBook. Thanks Alan for sharing your experience with us. 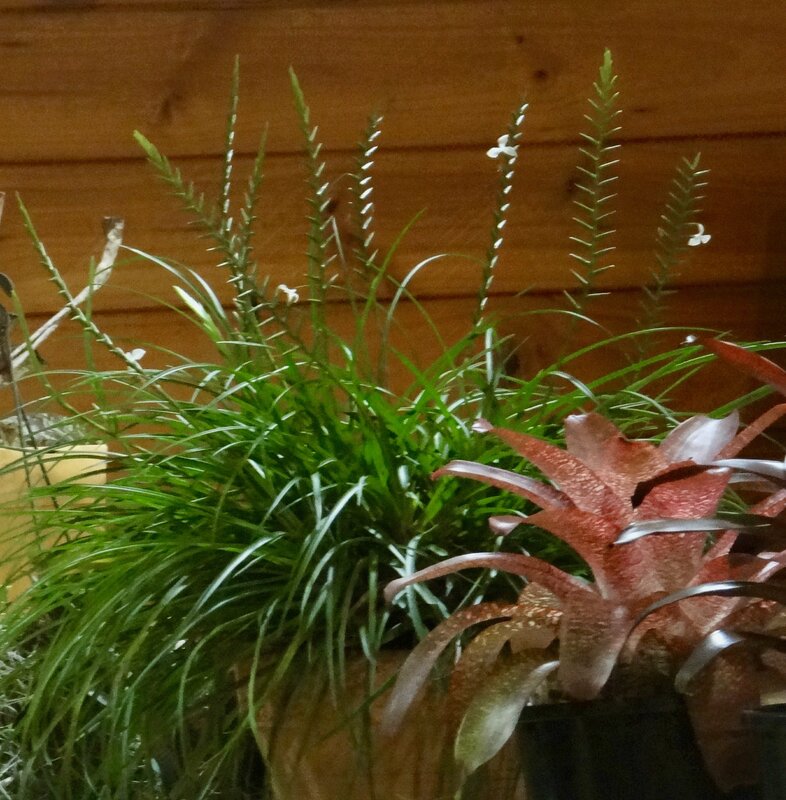 "Lessons Learnt From 10 Years of Landscaping With Bromeliads on an Acreage Property. Arno is a landscape architect and a long term member of our society. Arno King excited us with his venture into transforming a large block of land in Upper Brookfield into a beautiful garden that turned out to be dominated by bromeliads. He purchased the land in 2006: it was formerly an orchard and had good soil. It favourably faced north, and had no water from the municipal supply. Arno started by creating a dam on the crest of the hill in 2008, and had barely completed it when unusual heavy rain filled it overnight. A bore was on the property, but not connected till later. Water supply from the bore varies according to the rainfall. He later bought a 25,000 L. water tank. 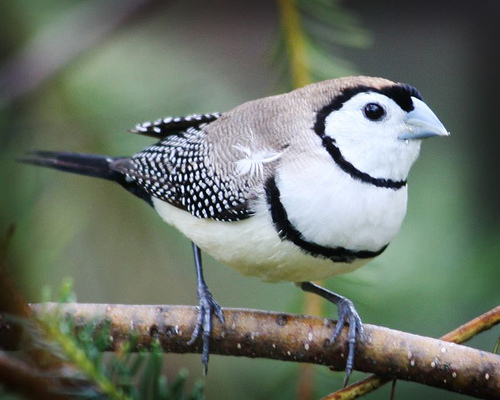 Wildlife abounds on his property, including wallabies, deer, scrub turkeys, and bandicoots. 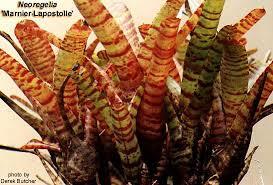 Succulent tuberous rhizomes like heliconias are vulnerable to scrub turkeys and need protection. Arno found that broms rot when given too much shade, a lot of water, and inadequate air movement. He lost many plants in the shade house from too much water. 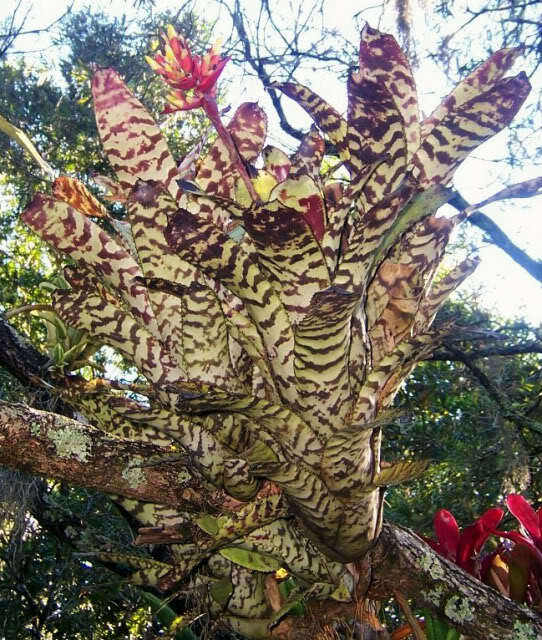 He has a great variety of plants growing, with large tracts of plants, including many bromeliads. Pineapples (Ananas) thrive there, but the fruit must be wrapped in newspaper to protect them from crows. 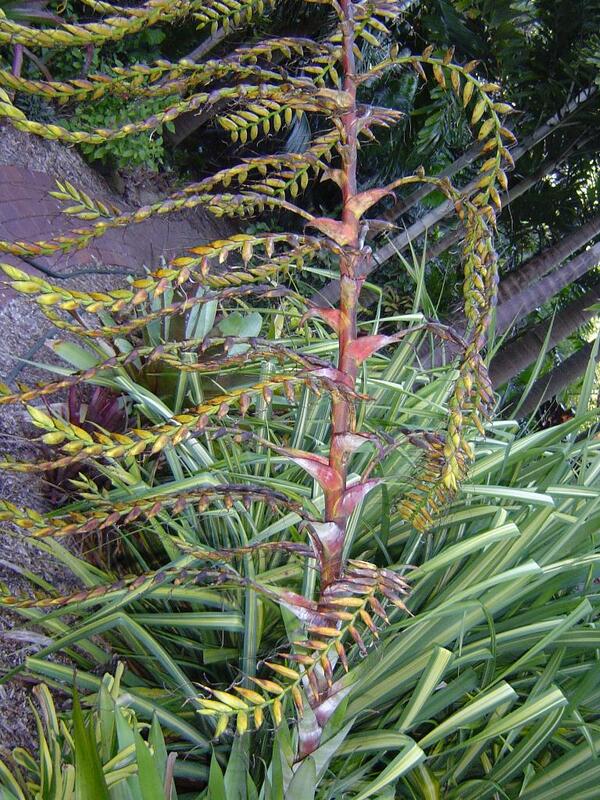 Aechmea 'Bert' is a favourite, is stoloniferous and climbs up trees. Billbergias grow well in large plantings. 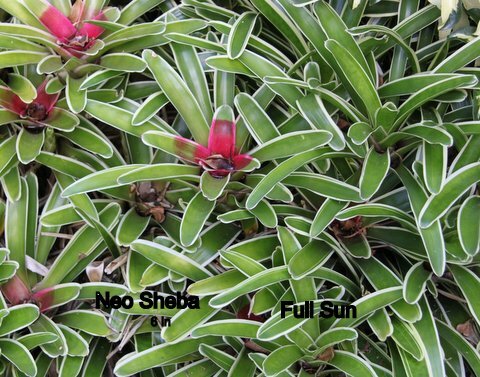 He has large plantings of Neo 'Sheba' (a spineless variegated clone of Neo. macwilliamsi ) and Neo 'Bossa Nova' (thought to be a variegated cultivar of compacta ). Neo 'Marnier-Lapostolle' (ampullacea x zonata) has proven very sun-tolerant. There was a range of Alcantareas, many blooming. Alcan glaziouana thrived, as did Alcan patriae with fab red stems and yellow bracts, on a 3.5m spike. Alcan imperialis also featured prominently. Aechmea blanchetiana red form from Pamela Koides impressed, as did his gold-red-orange form. An Aechmea compacta x 'Fire Ball' hybrid was unusual. 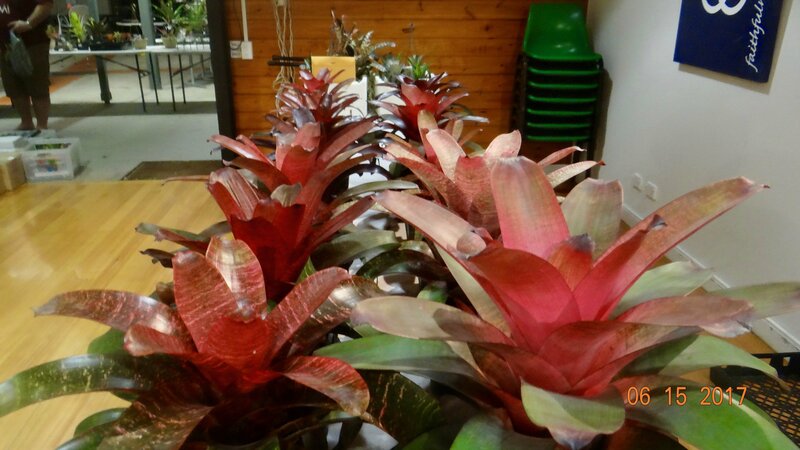 Arno pointed out that bromeliads are 'a good friend of other plants'. They hold water after rain, then release it slowly to nearby plants. Vriesea fosteriana 'Speckles' ( registered by John Catlan ) has proven to be tough, tolerating full sun. His was a interesting talk, giving us a few ideas that we could use in our garden. Neoregelia 'Sheba' (spineless variegated clone of macwilliamsii. The committee are keen to meet members needs and seek feedback on ways to improve our society's operations. A survey was emailed 17 June, 2017, with a deadline of 18.7.17. This will be analysed and results reported to members at the July meeting. As a follow up to my recent talk on ‘Genera Changes,’ I would like to address in detail two issues that came up in my talk. 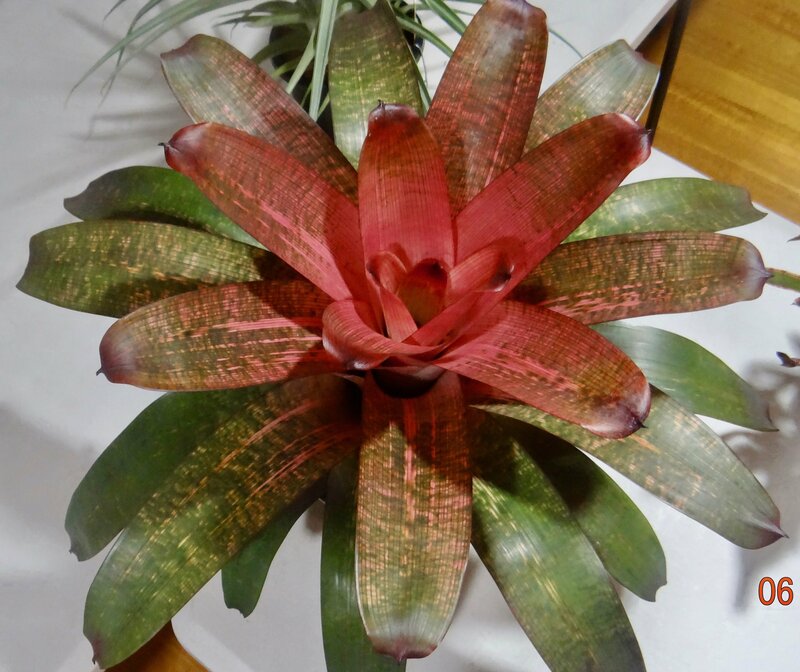 This bromeliad has caused much controversy since the 1800s when it was first described. 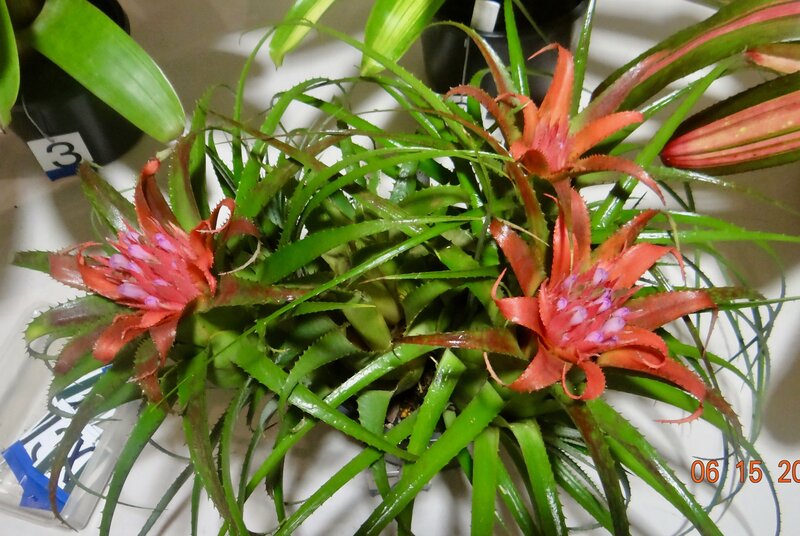 The Bromeliad Taxon List contains 26 references to Tillandsia lindenii including varieties. Derek Butcher says: “This just means that there are 26 references to botanists who have given THEIR interpretation of lindenii. By the new classification, many will become Wallisia cyanea, some Wallisia lindenii, some become Wallisia pretiosa, duvalii x, & some dropped all together. In other words just because you have lindenii on the label does not mean you can change it to Wallisea cyanea. Most of what we have as T. lindenii on the label have a substantial stem below the paddle & are probably the hybrid Wallisia ‘Duvalii’ “(see photo courtesy of the BCR). 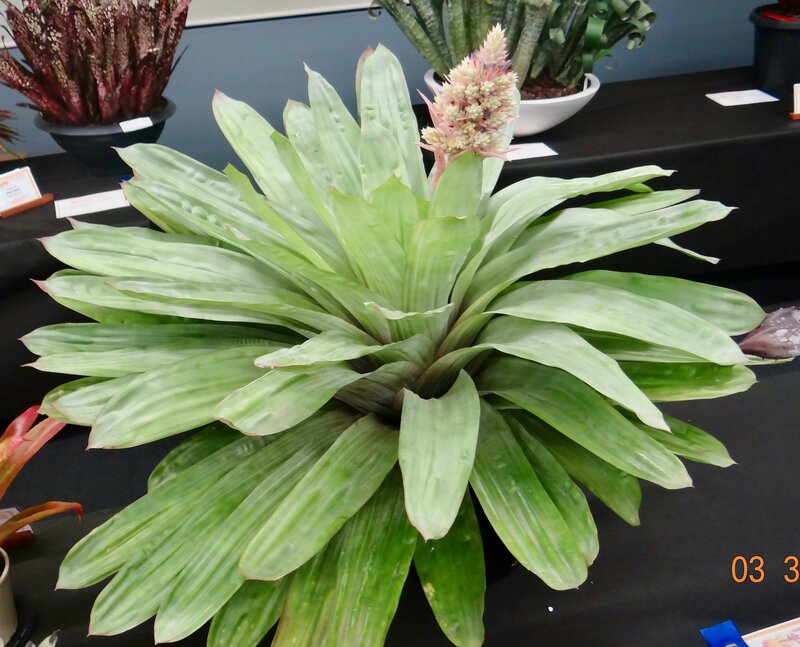 I have communicated with Derek Butcher & Eric Gouda (both of whom are responsible for the Bromeliad Taxon List) about this topic & they are both adamant that the T. lindenii currently in cultivation is actually T. ‘Duvalii’ & needs to be renamed as such. Here is an excerpt from the ‘bible’ on Botanical Latin’ by William T Stearn: Botanical Latin is essentially a written language, but the scientific names of plants often occur in speech. How they are pronounced really matters little provided they sound pleasant & are understood by all concerned. This is most likely to be attained by pronouncing them in accordance with the rules of classical Latin pronunciation. There are, however, several systems, since people tend to pronounce Latin words by analogy with words of their own language. In English speaking countries there exist two main systems, the traditional English pronunciation generally used by gardeners & botanists & the ‘reformed’ or ‘restored ‘ academic pronunciation adopted by classical scholars. There was some discussion on the night of my talk about the pronunciation of the diphthong ’ae’. According to Stearn, it can be pronounced ‘ai’ as in aisle (reformed academic) or ‘ea’ as in meat (traditional English). So to pronounce the genus Goudaea as Goo-dee-a is a correct option. 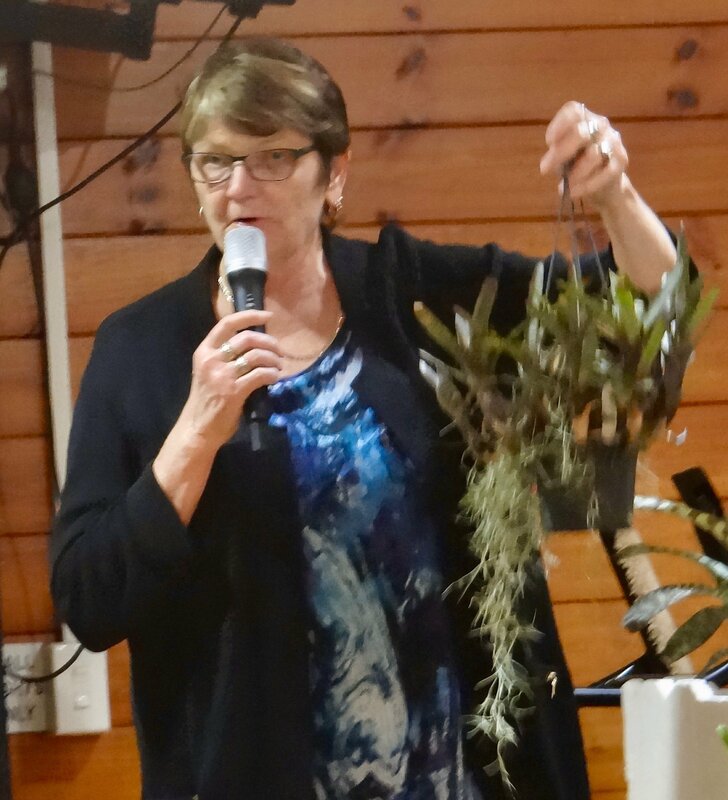 At the recent Bromeliad Conference at Caloundra I heard Alcantarea pronounced three different ways –all were ‘correct’ options. If the Botanical Latin name of a bromeliad includes the name of a person – quite often the Latin syllable emphasis is at odds with the syllable emphasis of the person’s name. This can make the exact pronunciation of the person’s name difficult. 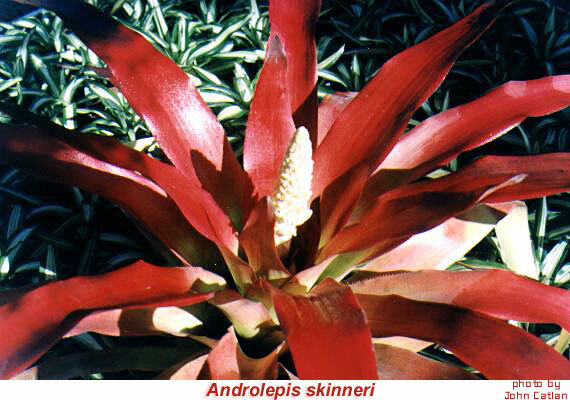 The bottom line is that there are ‘several ways to pronounce the Latin names of bromeliads’. so it likely has a nocturnal pollinator, probably an insect. It probably benefits from bright light. Peter Paroz with Till minutiflora. Tillandsia minutiflora from the inet. 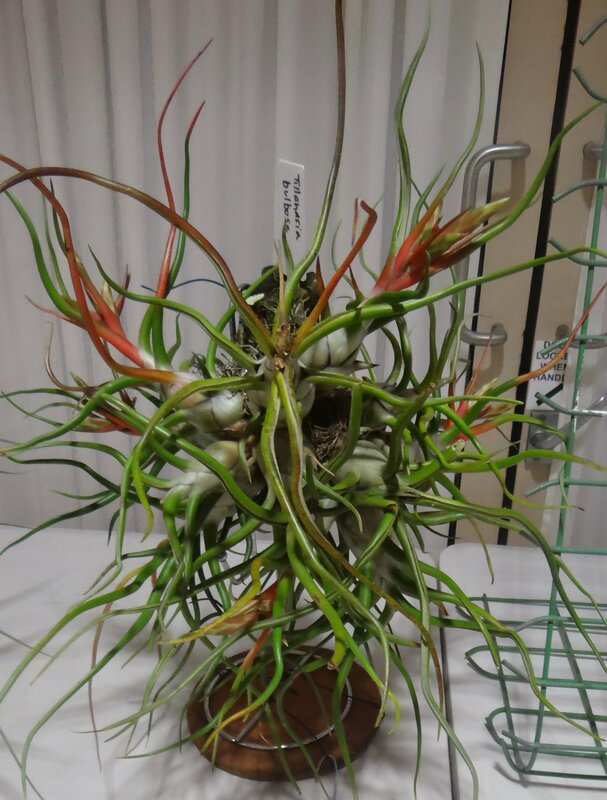 Tillandsia narthecioides from Peter Paroz. Narelle Aizelwood shows the Canistrum with a nest made from T. usenoides. 1st Vriesea 'John's Special'. from Dorothea Andreason. 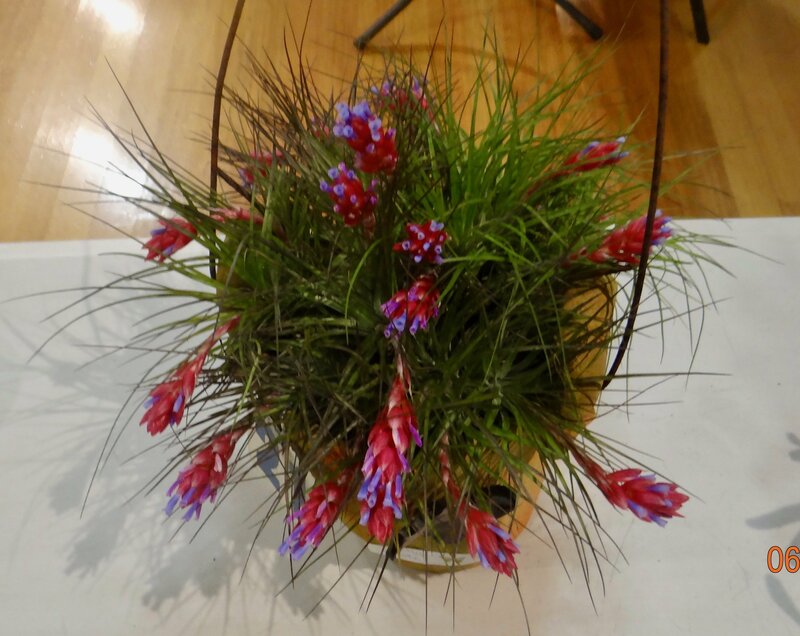 1st Tillandsia stricta from Denice McLean. 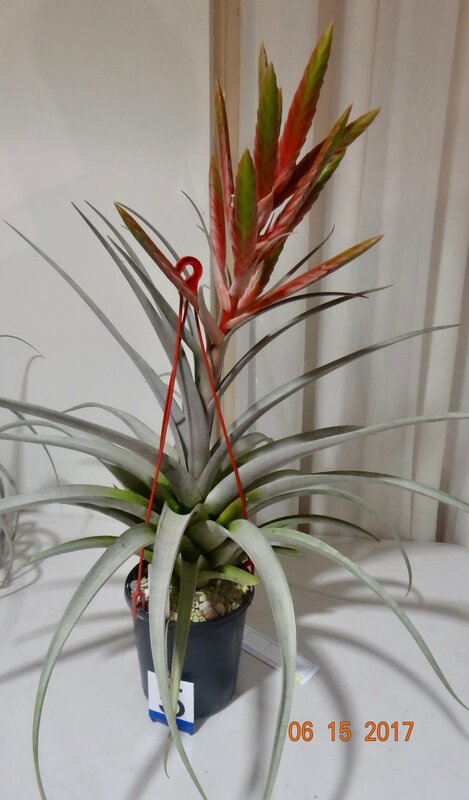 Tillandsia ehlersiana from Ron Jell. Aechmea recurvata from Ron Jell. has links with the blanchetiana group. How many plants can you enter into Competition ? For the Popular Vote, you can enter three plants only. making a maximum of eight plants. The Committee is keen to expand the range of plants on offer at meetings. Sales will be made open to the public so bring your plants in! The EKKA comes 11th to 20th August. Volunteers are needed to staff our display; four volunteers are needed daily for ten days. Volunteers are given free entry to the RNA Show. The potted plant competition at the EKKA was detailed in the last Newsletter. Prizes up to $100 to be won. and an extra $5.00 with your name embroidered on it. at home of Narelle & Greg Aizelwood. 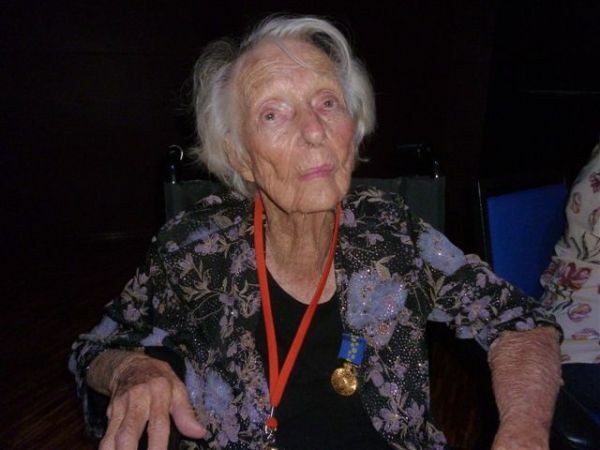 Grace Goode OAM will be celebrating her 100th Birthday in July and to help celebrate this occasion, arrangements have been made for Grace to attend the Saturday July 15 meeting of the Sunshine Coast Bromeliad Society. This is at 1:30pm, at The Community Hall, Millwell Road East, Maroochydore, 4558. December 7th – Christmas Party. Practical Class : Choosing plants for Competition with Barbara McCune and Ron Jell. Plant of the Month - Intergenerics with George Stamatis. Guest Speaker is George Stamatis on 'A Glimpse into the Future of Bromeliad Collecting in Australia. Plant of Month - Rare Genera. Popular Vote - see schedule below. 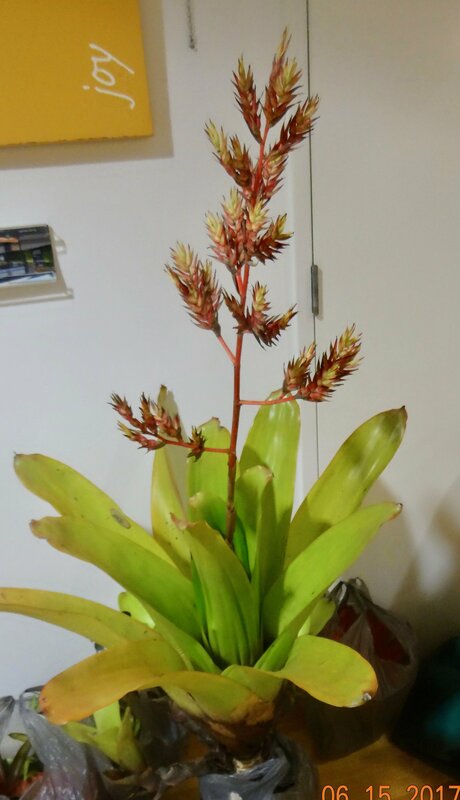 Copyright © 2017 The Bromeliad Society of Queensland Inc, All rights reserved.